Are you ready for your first jump? Have you decided it's time to take action? Have you been thinking about doing a jump for too long? 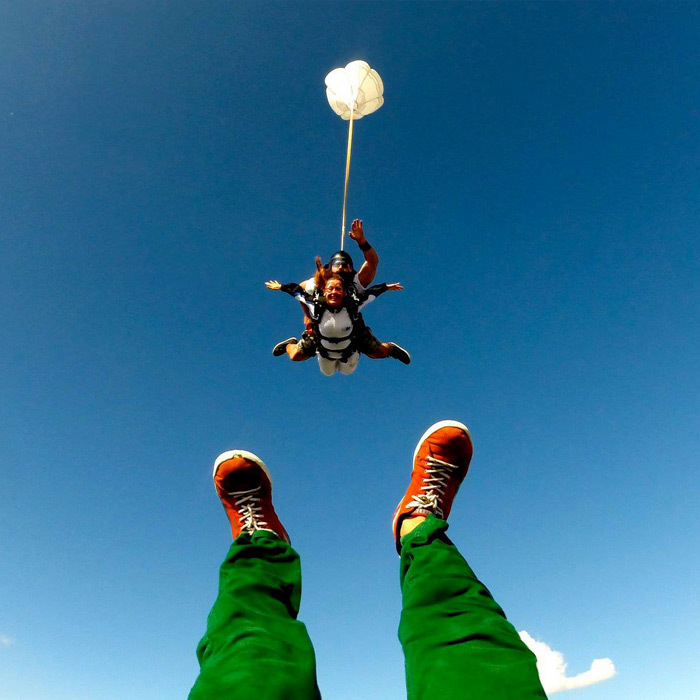 GoJump is the closest parachute club to Timisoara and Arad, which offers tandem jumps and parachuting courses to those who want to make this sport a new hobby. Book your reservation online or if you need help please feel free to contact us directly or visit our frequently asked questions page for more information. Tandem Parachute Jumping is ideal for those who want to jump without going through the necessary training to become a licensed parachutist. Tandem jumping is done together with one of our professional parachuting instructors using a parachute for two people. This parachute is much larger than the standard parachute and is built for the combined weight of two people. During a tandem jump, you will wear a harness and you will be tied to the parachutist instructor. After a basic training, very safe, on the ground, we prepare to fly in the plane. Now you will enjoy the wonderful view from the airplane before preparing for the jump. As you leave the plane, make sure you smile towards the camera. Memories are important! We set to 200 km / h and experience the unique feeling of free fall (empty). After opening the parachute, we will sky walk for about 5 minutes until we step back on land, while enjoying the wonderful views and splendid landscapes of the surroundings. Check out our prices and make your online booking today.